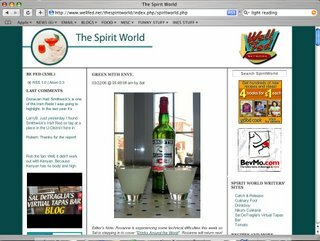 SAL DeTRAGLIA'S VIRTUAL TAPAS BAR: ABSINTHE MAKES THE HEART GROW FONDER. 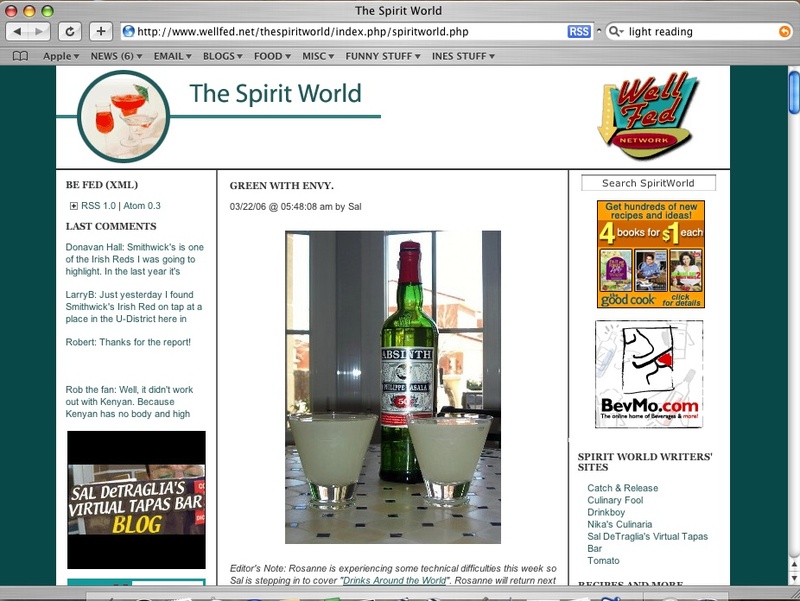 My scholarly dissertation on Absinthe is now published in The Spirit World. Oh, and Mr. Big Finn... please take special note of the recipe at the end of the article. I have now seen the error of my ways. Not only will my future guests not go blind from alcohol poisoning, but I won't run out of absinthe as quickly. Thanks for the recipe! The second link is a translation of an 1896 Pernod Fils Catalogue. Very interesting, I thought. Thrilled to see that you have joined the group of "legendary artists and writers". Good on ya! Huh - absenta. When I had my first taste of it, the tiny portion I swallowed decided on the way down it didn't really want to be there, u-turned, missed the logical exit while doubling back and left the temple that is my body through my nose. Boy, that stung. I couldn't smell nor taste anything for days afterwards. Bettina: I see that you've already met my friend The Big Finn. DJ Jazzy G: That's a great link. Thanks for that one. It's clear that you are an experienced Absinthe drinker. Not because of the weblink or because of your demonstrated knowledge of the topic. But because John Ashcroft told me so. Tread lightly. He's watching you. Sidney Pollack: Don't even get me started on my legendary successes as an architect, biochemist, philologist and synchronized swimmer. It's my blog, and I'll tell all lies that I want. We lived in Prague and always had a bottle of Absinthe to serve to guests. But it also makes a lovely decoration on a windowsill. I think my son had a bottle of it confiscated at the airport in Toronto? Very interesting. But...umm...is that one of your long-suffering neighbours hanging over the swingset in the picture at Spirit World? And Sal, you are definitely the stuff legends are made of! I'm just happy to see that you've survived your absinthe research! Many haven't! I only just managed to myself... but I was younger then, who knows what would happen if I tried it again!? And I'm with Christina, wasn't that your neighbor? And there's that table again! Not only do you have cooler liquor than I do, but your furniture is cooler, too. The first time I was served Absinthe was about 2-3 years ago, but pure. The colour alone mesmerizes me. I remember dipping my lips in the room temp warm green liquid and felt them and the tip of my tongue slowly going numb. I took it very well - I think. ;-) Ever since that experience, I love it. I'll definitely try your recipe. Gotta see if I still have absinthe left. Will let you know, but until then: "Cheers!" Sal, your blog is absolutely in my Top 3! Spain,food and drinks, just what I need after a long day's work. I'll be back regularly so keep the good stuff coming ;-) I think I'll have to put up a few recipes as well. What about some Indonesian food?? C-Swiss: You drank it straight?! You're lucky that your teeth didn't disintegrate. You're the third person I know in Basel who drinks absinthe straight. And to think...we all assumed that the people in Switzerland lived a quite life of nibbling chocolate and building watches. BTW...I'll put you on my sidebar later today...as soon as I've had a bit more caffeine. Orange-X: Hello. I've seen you around on some other blogs. Glad you finally made it to mine. I've only eaten Indonesian food once, and it was in Amsterdam. I loved it. The only reason I haven't eaten any since, is that I never seem to find any Indonesian restaurants in the places I live. So yes...Indonesian recipes would be welcome. BTW...thanks to your nation for giving the world Helena Christiansen. Ang: That table has made quite a few appearances on this blog over the past two years. There are certain benefits to living close to Morrocco. Hehe- I have very good teeth :-D Hey, and remember, I'm half Canadian, so chocolate's ok, but I don't live from it. Thanks for adding me to your sidebar. I'll do the same later today. LET'S PLAY..."GUESS WHAT SAL IS DOING?" LOOKING FOR COMEDY IN THE SPANISH-SPEAKING WORLD. MY NAME IS SAL, AND I’M ADDICTED TO LAZYTOWN.